Tree Twirlers are such fun to make! We love making our own Christmas decorations for our tree and our home. There is something really delightful about making them with the kids too, so we decided to share our tree twirlers with you today! First, select two different coloured pipe cleaners and twist together at one end to secure them. Next, take the pencil or dowel and place it at the top of the pipe cleaners, where they are twisted together. Then, bend the pipe cleaners around the pencil. Finally, removed the pencil from the pipe cleaner twirlers. Add a piece of thread to the top and hang them on the tree or around the room! Why not try adding some glitter glue to make them extra sparkly or experiment with different amounts of pipe cleaners and the directions you bend them in! We really enjoyed making these and they are so easy and quick for youngsters to make as well. An ideal rainy or snowy day project on the lead up to the festive season! We are delighted to be taking part in the Kid-Made Christmas Ornaments Blog Hop this year hosted by Crafty Mama in ME. Packed full of great and simple ideas for you to keep your youngsters engaged and occupied during the festive season! Join us as we will be taking part later in the series too! Thank you we enjoyed it too! 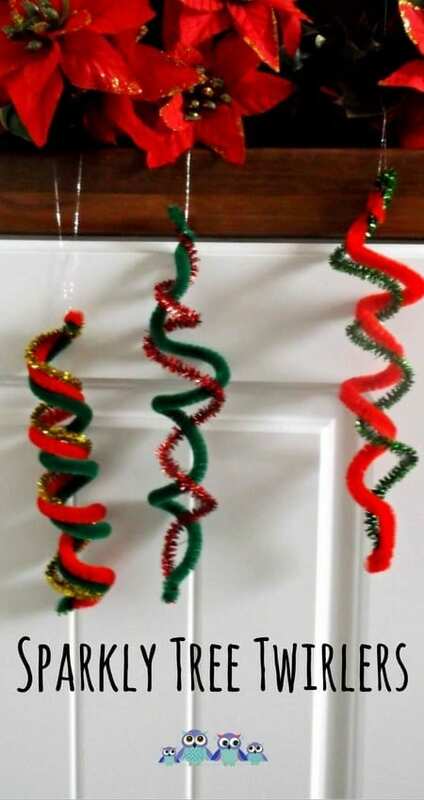 Now say Tree Twirlers 10 times fast… I LOVE this idea, so simple and wonderfully wonderful! You cannot beat a festive tongue twister! This is so nice! Kids like pipe cleaners and this offers an opportunity for real use and being able to use many of them which they will love. Throw out the tinsel! Thank you. Shared online! Simple and effective, our kind of Christmas craft.